This femizee ballet flat are fashion with flower and beaded design. 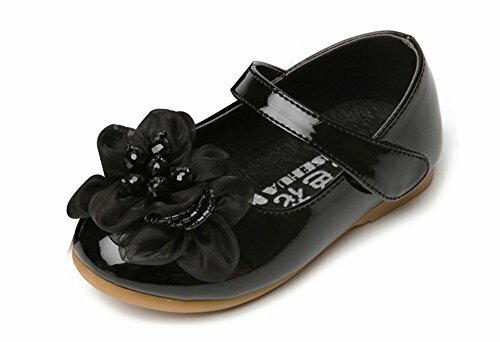 Good for wedding,party,dress...baby girls can feel safe wearing them to walk thanks to its non-skid and flexible outsole. Great for everyday wear. Round toe design,protect toes and keep dirtout,their little feet will stay comfortable and protected all-day long. High qulity PU leather,make shoes water friendly and easy cleaning for mom. Femizee commit to providing high quality and comfortable,fashion and casual products for growing children. No matter shoes you need,from athletic shoes like running or walking,to dress shoes like mary jane or oxfords,or to slip ons like loafers or flats... let boys and girls companion with Femizee. Growing together! Please according to your kid's foot length cm buy shoes, not according to age.This shoes carry with Chinese size. We strongly recommend you to measure your Foot Length. To help you choose correct suitable size easily,we have converted into US size for your selection. Thanks for your shopping. If you have any questions about this product by Femizee, contact us by completing and submitting the form below. If you are looking for a specif part number, please include it with your message.